Tillie McGrath left Ireland with her fiancé hoping for a better life. When her fiancé dies on their way to America, she’s left with a broken heart and torn dreams. Captain Keondric Morgan has never forgotten Tillie since her stay on his ship. When he discovers that Tillie’s fiancé was actually murdered, not just sick, he seeks out Tillie to make sure she’s okay and begin investigations on the murder. What they discover puts them all in grave danger as they uncover a plot that is way beyond their imaginings. Tide and Tempest was mysterious, cute, and suspenseful! All of the characters were lovable and endearing, especially Morgan’s brother Cass. Tillie annoyed me at times, but by the end I liked her. The plot was very interesting; it kept me guessing at what was going to happen. The dialogue and scene was authentic, I felt as if I had been brought back in time! My favorite part of the story was when Tillie finally realized that she had to forgive herself to move on. It made me realize that most of the time we are what’s holding us back. 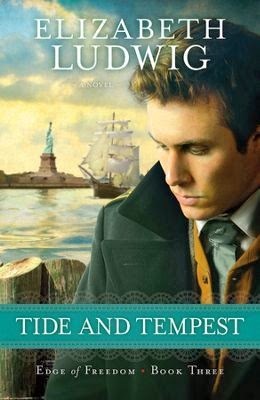 Overall I liked Tide and Tempest for being an entertaining, sweet, and suspenseful historical read! I love it when books teach you little lessons and this one had a few gems. I would recommend it to all historical fiction lovers. I am looking forward to reading more of the Edge of Freedom books! QOTD: Historical fiction…yea or nay?